I am amazed how many adults start conversations with me by saying, “You know I’m just not a technology person & I can’t use these tools in very powerful ways.” In our digital era this is tantamount to an admission of illiteracy, & even worse, a desire to remain illiterate. An alarming number of adults today define themselves as technology illiterate & often actively anti-technology. They verbalize their identity in ways young people never do nor likely ever will. This is a very real digital divide, & it’s powerful because it’s tied to identity. As a self-professed “technology fear therapist” these professions of anti-technology adult identity are puzzling as well as troubling. I think this reflects, in part, the fast pace of disruptive change in society today, & our need to process it together more slowly. On a practical level, I frequently strategize ways to constructively engage those who are adamantly anti-technology. Amplifying the voices of young people sharing their excitement for learning which is enabled / empowered by technology is a favorite method. But it’s vital to help others understand I’m not just “pro-technology.” I’m pro-learning, pro-engagement, pro-relationships, pro-conversations. All those things can be strengthened & even transformed by the thoughtful & deliberate use of technology. 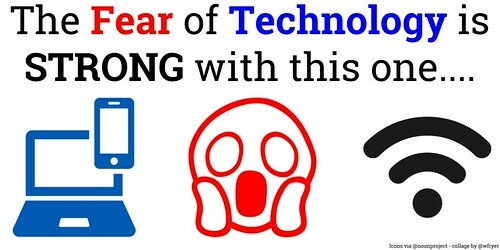 Sometimes these conversations with “anti-tech” or “tech-fearful” adults make me realize what a different world I live in & different reality I experience DAILY because I’m a connected educator. So helping others connect with a Professional Learning Network (PLN) via social media is also an important strategy. Here is an embedded version of the first tweet in this series. You’ll need to click the link to see the entire thread with replies. Let me first offer this set of threaded tweets and replies as “exhibit A” to people who decry Twitter as a platform devoid of conversations. As Jason Neiffer (@techsavvyteach) has mentioned several times on The EdTech Situation Room (@edtechSR), Twitter can be a challenging place to disagree thoughtfully and at length with others. The text character limitations of the medium, as well as our general tendency to “dip to a rather shallow depth” with ideas rather than engage deeply with them and with other minds on social media, contribute to these challenges. Twitter CAN, however, offer space to share “threaded thoughts,” as I did in this situation, and invite others to both read as well as engage with more complicated thoughts. I continue to advocate strongly for the positive learning and connections which Twitter fosters specifically among connected educators. This threaded set of ideas shared on Twitter is another supportive example of that case I’ve attempted to make here on my blog. In reflecting on some of the responses these tweets invited, I found it affirming that I’m not alone in these sentiments. Other educators frequently interact with other adults in other places who share similar sentiments and project similar ideas about their own identities as “non-tech” users. I agree. I heard a principal who is about my age (38) joke about how “I don’t know how to use all this tech.” In my head I’m like “dude, you were born in the tech era. You’ve lived the majority of your life with tech than without. What are you talking about? Others observed these kinds of responses happen in different domains besides technology, including mathematics. I agree with Erik Kramer (@techerkramer) that past, traumatic experiences may explain these responses. This speaks to the idea I shared in the original Twitter thread, that we’re living in EXTREMELY disruptive and fast-changing times, which we all need more TIME together to process, digest, and come to terms with. I here this same phrase regarding mathematics. Often these sentiments are traceable to traumatic initial experiences. The ideas in this thread also point to our need for “technology fear therapy.” I’ve been using the title, “technology fear therapist” in my Twitter profile for a few months now, and it’s NOT a joke. As a school director of technology and technology integration coach with teachers, one of my most important roles is building relationships of trust with others and helping them “stretch” both their uses of technology and their self-perceptions when it comes to effective technology use. I see my role as helping other teachers thoughtfully embrace new and transformative uses of technology which improve teaching and learning. I see this every day (it isn’t just older adults – can be 20s.) It is justified by “technology is distracting” or that it takes too much time when it is often fear or resistance to learning something new. Can I borrow the phrase “tech fear therapist?” It’s perfect! "The FEAR ? is STRONG ?? with that one…." ? #DigCit #TechFearTherapy ?? I’ve proposed (in partial seriousness) that Carl and I should “found an online institute for technology fear therapy.” I’m not sure what final form this will take (it might become a co-led, online mini-course) but am sure the ideas which underlie this train of thought will continue to move forward. The technology fear therapy train has left the station, because so many adults today are afflicted by it and are in need of helpful counselors. Recognize “technology fear therapy” invites an ongoing conversation and “journey of learning” together. The issues which you identify and the seeds of healthy therapy which you sow will not be resolved or take root immediately. They take time to understand, process, and address effectively. Share and model a “growth mindset” when it comes to technology use and specifically overcoming technology fears. Utilizing a password manager (like LastPass @lastpass) and enabling MFA (multi-factor authentication) on every important website you use are two specific ways to “walk the walk” of a technology growth mindset. Regularly amplify transformative uses of technology with other teachers and parents when you can. Do this in face-to-face conversations as well as via social media, and gatherings when appropriate. Currently at school, we’re doing this through our Seesaw learning journals, on Twitter via our #CasadyLearns hashtag, via our “Casady Learns Google+ Learning Community,” via our Technology Showcase blog, on personal blogs, and also via Facebook from time to time. Helping others educators become connected online with others who are passionate about shared topics of interest, are actively sharing their own learning, and seeking “the wisdom of the crowd” (which is a very real thing in the EduTwitterVerse) is powerful and can be transformative. I recently updated my own “Yodas” Twitter list both for my own benefit (I love following this list in Flipboard (@flipboard) and to encourage others to follow this great group of Twitter using educators. Pair conversations about thoughtful and constructive uses of technology with digital citizenship. Resources related to digital citizenship that we’ve been sharing with students, parents and teachers at our school are on the website digcit.us. Consider sharing resources and connecting with others on Twitter using the hashtag #DigCit. Consider sharing articles and thoughts related to technology fear therapy on Twitter using the hashtag #TechFearTherapy. This not only provides a good way to share and archive related article links, but also provides a way to connect with others interested in this topic. Remember the transformative power of STUDENTS sharing their joy of learning using technology, to win over the hearts and minds of adults with whom “technology fear is strong.” This can especially be true when students are creating original projects in an environment like Scratch, or tinkering with robots. What are your thoughts about all of this? Do you have other ideas to add to my initial list of “technology fear therapist first principles and strategies?” Please share them as a comment below, or on Twitter by adding to the original tweet thread. You can also reach out to me via my personal contact form.